Rawcode specialises in creating Management Information Systems, Intranet and database applications. Realtime management information (reporting systems) can provide clear insight to your business processes. Bespoke solutions are developed closely with your business to ensure maximum effect. "Artemis" is Waldo Ltd's bespoke Management Information System. Designed and developed by Waldo's IT department and Rawcode Computer Consultancy Ltd, the Artemis system supports the flexographic industry and its ever changing needs. Artemis has replaced most paper systems within the company and fully streamlined the entire workflow from customer specification through work planning and time management to plate delivery. Designed for further integration into Waldo's existing Esko-Graphics workflow system, for maximum automation. All staff throughout Waldo have welcomed the new system as a huge step forward in customer support and service. Artemis is a multi-user Intranet system that shows, at a glance; current workload, dispatch list and more, allows time and material tracking and can provide full reporting capability. Specialising in intranet applications and database applications, we provide you with the tools you need for business. Reporting, tracking, data recording and work flow systems. Dream City manufacture and supply headboards and other furniture. 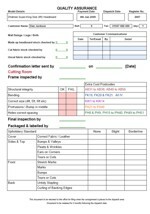 The system maintains a log of previous orders and a customer database, for use with mail shots and customer service material. 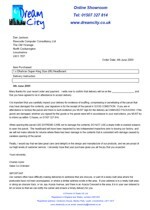 Order confirmation letters are automatically produced as well as tailored Quality Assurance forms, for use in the factory. What's an Intranet? A private network, within an organisation, that uses typical internet technologies to provide services to the business. Intranet applications can typically support multiple users simultaneously. What sort of services? For example; order management, job workflow and status, time and material recording and tracking, company information, an employee directory, customer relationship management systems, data analysis and reporting systems. Most paper-based form systems can be implemented on an intranet, and a lot more. Why would I need an Intranet? If your organisation has many staff or staff who are dispersed, regularly changes stock or inventory, needs an organised system to track customer orders and details, then an intranet system can help. Reporting functionality can be effectively delivered through an intranet. Full, impartial advice given.